Larisa Shepitko’s The Ascent is one of the most tactile of films. The soundtrack submerges the audience in harsh, overbearing sounds: the heavy creak of wooden floors, the sharp crunch of snow, the popping of seeds being chewed by starving villagers, the pneumonic wheezing of wounded soldiers, the shrieking scream of a mother separated from her children. 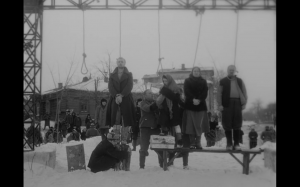 The screen is pierced by harrowing images: snowy fields so white it hurts the eye, extreme close-ups on faces palsied with pain and fear, claustrophobic cells that swallow their prisoners, and the face of Nazi killers, smiling… always smiling. 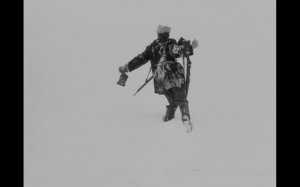 The Ascent is not a film that you watch; it is a film you experience. 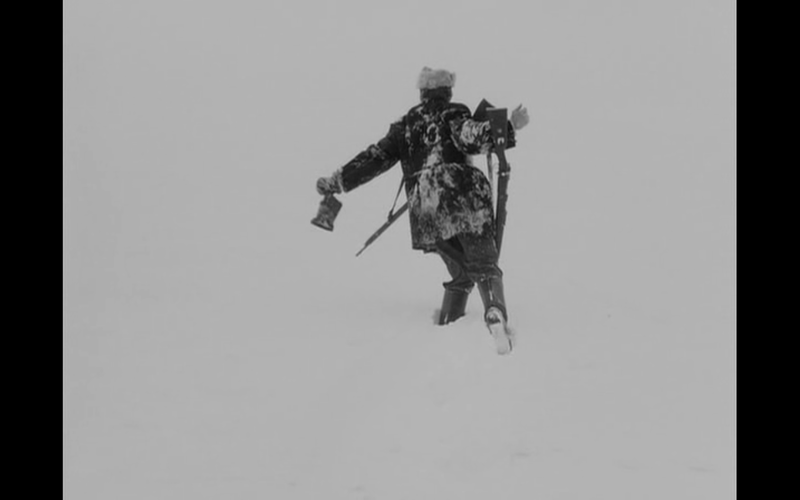 The last film by Shepitko before her tragic death in a car accident at the age of 41, The Ascent is a miracle of filmmaking, a perfect synthesis of ideological opposites: Soviet nationalism (atheistic by its very nature) and stark Christian allegory. 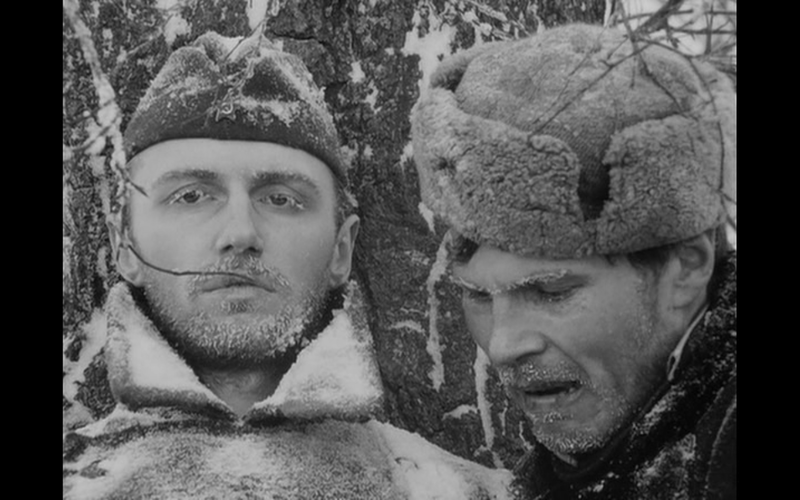 The film follows two Soviet partisans in World War Two who stumble through the Belarusian countryside evading Nazi patrols and desperately seeking food and shelter. Aching from hunger and slowly freezing to death, their mission is one of survival, not warfare. But that doesn’t stop the Nazis from arresting two innocent civilians they stole from when they are inevitably captured. Brutally interrogated, one soldier named Sotnikov (Boris Plotnikov) manages to resist their tortures while the other, Rybak (Vladimir Gostyukhin), cracks almost immediately. Regardless, they are both scheduled to be executed along with the two civilians at daybreak. Sotnikov and Rybak face a chilling decision: resistance or capitulation, martyrdom or collaboration. The Ascent beatifies Sotnikov as both Christian saint and Communist patriot while condemning Rybak as both a Judas and political traitor. Such contradictions are made possible by Shepitko’s transformation of the story into pure allegory. Sotnikov and Rybak aren’t just characters who inhabit a specific culture, time, and place in human history, they are archetypes through which Shepitko tells an unforgettable story about the very essence of human nature, of betrayal, of resilience, and of defiance in the face of incomprehensible evil. Known as the Great Patriotic War in Russia, the fighting at the Eastern Front of the Second World War was among the most cataclysmic and apocalyptic in all of human history. As many as 28 million people were slaughtered at the hands of the Nazis. More Russian civilians were murdered than the combined death tolls sustained by Great Britain, France, and the United States of America. 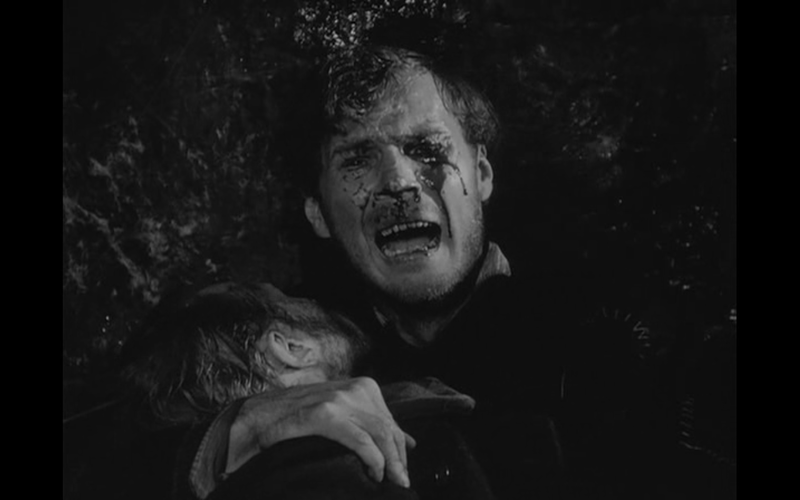 The fighting left a psychological scar that will never fully heal, and the cinema was one of the most effective tools used by Soviet artists to exorcise the horrors of the bloodshed. The result was a string of masterpieces which are still nearly unparalleled in terms of artistic genius and intensity: Mikhail Kalatozov’s The Cranes Are Flying (1957), Andrei Tarkovsky’s Ivan’s Childhood (1962), and Elem Klimov’s Come and See (1985), to name just a few. And standing tall among them as a full equal is The Ascent, a film of uncommon power and even more uncommon brilliance. Nathanael Hood is a 27 year old film critic currently based out of Manhattan with a passion for all things cinematic. He graduated from New York University - Tisch with a degree in Film Studies. He is currently a writer for TheYoungFolks.com, TheRetroSet.com, AudiencesEverywhere.net, and MovieMezzanine.com. Next ArticleTV Review: Outlander 1x02 - "Castle Leoch"